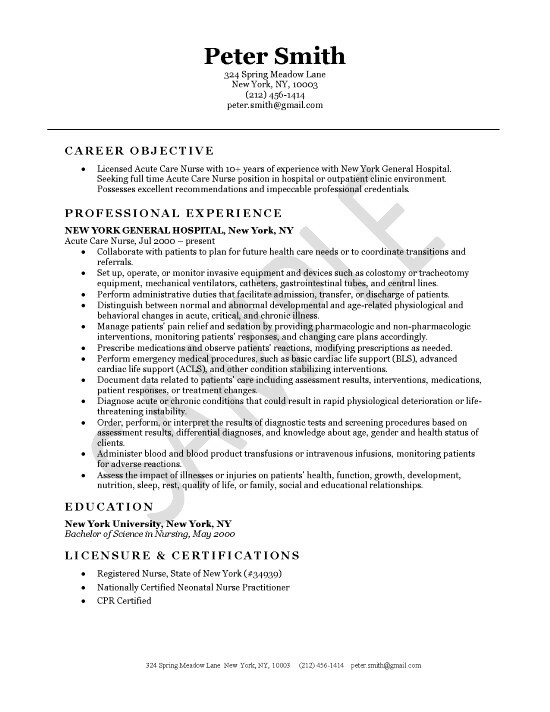 Below you will find a resume Example for health care professional with job experience in Acute Care Nursing. This can be a useful resource for most people seeking nursing positions. A career objective is used to clearly document the job target. The statement emphasizes 10 years of experience as an acute care nurse in outpatient clinic environment. The experience section lists duties and responsibilities such as patient collaboration, medical assessment, acute/critical care and emergency medical procedures. The statements go on to feature other skills including diagnostic testing, blood transfusions, documentation and administration. Training includes a B. S. in Nursing, Registered Nurse certification and CPR certification. Work in critical area of Emergency Department to deliver acute care nursing. Manage patient care team to provide full range of patient services. Provide complex clinical assessments, diagnostic testing and therapies for acutely ill patients. Administer medications and perform general physical therapy on patients. Draw blood, take vital signs, administer IV’s, utilize electrical medical devices and conduct testing. Document patient care and status, while maintaining internal guidelines and external standards. Assess family needs, relay critical information and provide emotional support. Attend staff meetings, project meetings, conferences and continuing education programs.